Dublin City in the 1650’s was a very different place to that we all know and love today. It was a walled city – with heavily fortified gates at intervals along its perimeter. In 1649, with a Royalist army encamped in the grassy expanse surrounding Rathmines Castle, the Parliamentary commander of Dublin launched a surprise attack against nearby Baggotrath Castle – the surprise and victory was so complete, that they chased the remnants back to their camp in Rathmines and destroyed Ormonde’s army before it had breakfast. In the aftermath of the battle, Ormonde withdrew his remaining troops from around Dublin, allowing Oliver Cromwell to land in the city (at Ringsend) with 15,000 veteran troops on 15 August. Cromwell called the battle “an astonishing mercy”, taking it as a sign that God had approved of his conquest of Ireland. 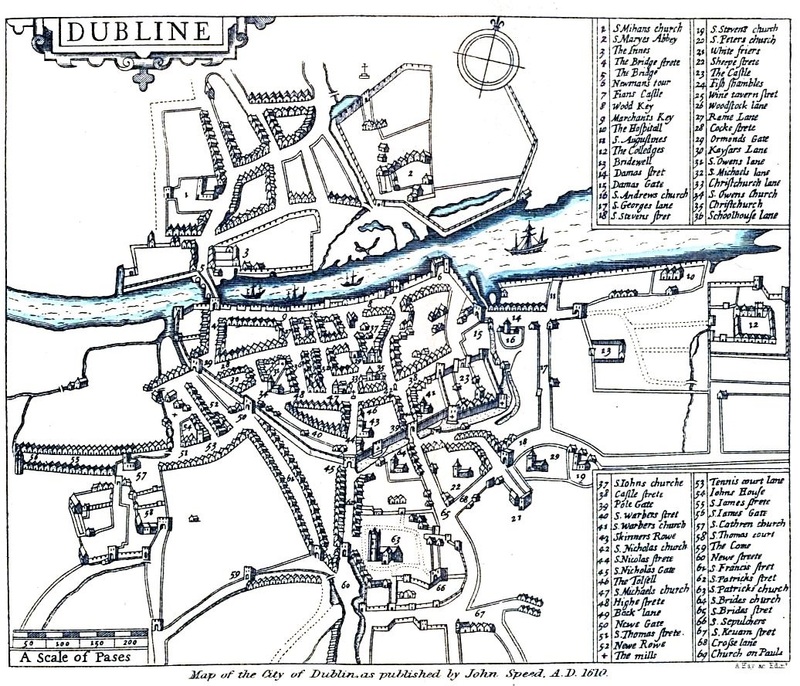 Speed’s Map of Dublin, 1610 – the walls and gates are shown. Note: the recently founded Trinity College is outside of the walls, to the east of the city on reclaimed ground. 1659 continued under the control of the adherents of the Commonwealth of England, and steps were taken by them to exclude Roman Catholics as well Exclusion of Protestant royalists. Proscriptive measures, war and plague had largely diminished the population of Dublin, and produced for a time a general depreciation of civic property. Many of the houses had been demolished, others verged on ruin, and but few manufacturers, traders or artizans remained in Dublin. 1657 – Whereas Francis Gregorie, servant to Mr. Henry Ballardt, one of the Sheriffes of this cittie of Dublin, Ballardt. did peticion unto this said assemblie, sheweinge that there is due unto his said master the somme of eightie pounds, sterling, for a banquett which hee furnished Banquet. this cittie with, on the freedome of the right honourable the lord Henry Cromwell unto this cittie, … [DUBLIN ASSEMBLY ROLL, 1657.]. The Great Rebellion of 1641-52 had a devastating effect on Ireland as a whole with all sides practising what would now be called ethnic cleansing and military attacks on the civilian population. In Ulster, the Protestant farmers fled to the cities of refuge and the Catholic farmers became nomadic followers of the Confederate army. The “no-mans-land” in between Confederate and British held territory in Leinster and Munster was repeatedly raided and burned, with the result that it too became de-populated. William Petty, a Cromwellian who conducted the first scientific land and demographic survey of Ireland in the 1650s (the Down Survey), concluded that at least 400,000 people and maybe as many as 620,000 had died in Ireland between 1641 and 1653. The Adventurers’ Act of 1642 was designed to pay the army needed to subdue the rebellion by using borrowed money – repayment would come from confiscating the rebels’ lands and selling them. It invited members of the public to invest £200 for which they would receive 1,000 acres (4 km²) of lands that would be confiscated from rebels in Ireland: 2,500,000 acres of Irish land were set aside for this purpose. The enactment was done at the request of King Charles in the House of Lords, joined for this by the Commons, and was unanimously accepted without any debate. The “Adventurers” were so called because they were risking their money at a time when the Crown had just had to pay for the expensive and disastrous Bishops’ Wars in 1639-40. The Cromwellian Campaign of 1650-52 had a hidden tragedy whereby a further 25% of the population died as a result of deliberately induced famine, which also encouraged the spread of diseases such as dysentery and the plague. By 1653, when the last formal surrenders of the war took place, the country had been devastated, the population decimated, the economic infrastructure destroyed. The English had effectively created a blank slate in Ireland onto which they now sought to project a new plantation society. The Land Grant Act of 1652 was designed to allow the new (republican) Government of the Commonwealth to confiscate all walled towns, Church property and estates belonging to ‘Irish Papists’. Over 2.5 million acres of land was confiscated (firstly) to punish those who took part in the rebellion and (secondly) to repay the adventurers who funded Cromwell’s campaign in Ireland and (also) to repay Cromwell’s officers and soldiers – 34,000 horsemen, dragoons and infantry. Increasing arrears of pay were generating costs of about £600,000 annually. To defray the mounting debt, the disbanded soldiers were to be paid in debentures of confiscated land rather than cash. The Act of Settlement of 1652 – as the war drew to a close in 1652, the English parliament passed the Act of Settlement, which specified who exactly would forfeit land in Ireland. The list included those who had taken part in or supported the initial rebellion in 1641-2, as well as anybody guilty of murdering civilians during the entire course of the conflict. Technically, almost the entire male Catholic population could have been encompassed within these terms but it soon became clear that the English parliament was more interested in dispossessing Catholic landowners than targeting those guilty of alleged crimes during the war. 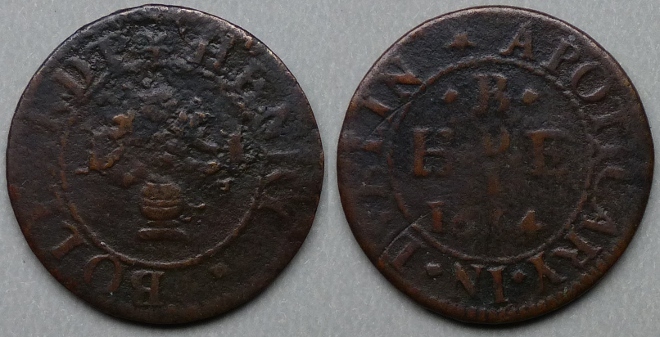 The subject of this post (Henry Bollardt) produced a trade token in 1654. Where did his family come from? At this time, throughout Ireland, small coins were scarce throughout the country and in common with other shopkeepers apothecaries sometimes issued their own tokens. Apart from Henry Bollardt, two other Dublin apothecaries did so – Gerard Colley and Henry Rugge. Apothecaries were the pharmacists of their day, and the first Dublin apothecary of whom we have record is Thomas Smith, who had studied in England. He became mayor of the city in 1591–92, and during his term of office laid the foundation stone of TCD. When he complained to Sir Henry Sidney, the Lord Deputy, that most of the natives found his medicine too expensive, he was given a grant to enable him to provide medicines “for those of English birth, the nobility and those of the graver and civiler sort”. Charles I is credited with founding the Royal College of Physicians in Ireland in 1626 and the 1692 Charter of William and Mary empowered the College of Physicians to examine all would-be apothecaries’ apprentices, fining masters £20 if they failed to comply with this regulation. College officers might also inspect apothecaries’ premises and destroy drugs found to be unfit for use. Henry Bollardt was an apothecary during the 1650’s so he would not have had any interference from the medical profession – who also prepared their own medicines as a matter of convenience. For they’re the men we most can do without. Who was Henry Bollardt ? According to the Dublin Assemby Roll of 1656, Henry Bollard was chosen to be one of the Sherriffs of the City of Dublin for the following year (1656/57), instead and in place of Mr John Knot. The Sheriff of Dublin City was the Sovereign’s judicial representative in Dublin. Besides his judicial importance, the sheriff had ceremonial and administrative functions and executed High Court Writs. Was this Henry Ballard the same man as Henry Bollardt? 1657 – Mr – Richard Phillipps and Mr. Henry Bollardt are chosen masters of the cittie workes for the said yeare. [DUBLIN ASSEMBLY ROLL, 1657.]. Did he arrive in Dublin with Cromwell’s army, or was he previously resident there? This is a trickier question to answer since Henry does not appear on any Roll entries prior to the 1650’s although there are a few clues elsewhere. Born about 1645 in Dublin, Ireland. George Ballard was a Sugar Baker. 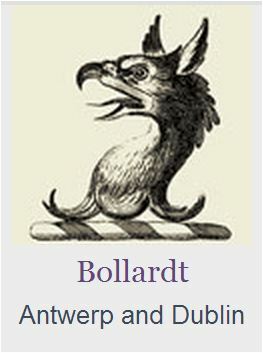 If George is Henry’s son, (speculative, based on date and proximity, also the Dutch spelling of Bollard), then John Bollard, a Flemish merchant of Antwerp was his grandfather. This John Bollard presumably left Antwerp at the height of the Sugar trade in Antwerp and was probably a Sugar or Cloth Merchant. Born about 1590 in Antwerp, Netherlands. 1672, March 26th, Martha, dau of George Bollard, sugar baker, & Margt, his wife. 1681. Nov 20th, Bapt, Catherine, dua of George Bollord, sugar baker, and Margaret his wife. 1689. Aug 27th, Bapt, Arthur, son of John Bollard & Charity, his wife. 1698, Nov 18th, Burial, Honor Bollard, Widdow. 1657 – That Mr. Henry Bollardt, apothecarie, shall have a lease, for the tearme of sixtie and one yeares from the five and twentieth day of March next, one thousand, six hundred, fiftie eight, uppon a wast plott of ground 1657-s. over against Mr. Daniel Beggs buildeings, and adjoyne- inge to the house of one Nicholls, a dyer, neere Polegate, Poiegate. and in breadth from the said Nicholls house aforsaid to the cittie wall thirtie seaven foote, at the yearelie rent of fortie shillings, sterling, with such other covenants and condicions as Mr. Recorder shall thinke fitt to bee inserted in the said lease. This is a map constructed by an historian – Leonard Strangeway’s 1904 The Walls of Dublin. It depicts the medieval city and walls, but it was made much later. Unlike most maps, Strangeways’ map is “the other way round” so please bear in mind here that South is “up” and North is “down”. The walls and fortifications around Dublin were first in the 9th C but the defences of Dublin eventually fell into disrepair – although they continued to serve a purpose as late as 1762. In that year, an auction took place – selling the rights to collect tolls at each of the (then) seven city gates. This auction raised £4,000 for the city. 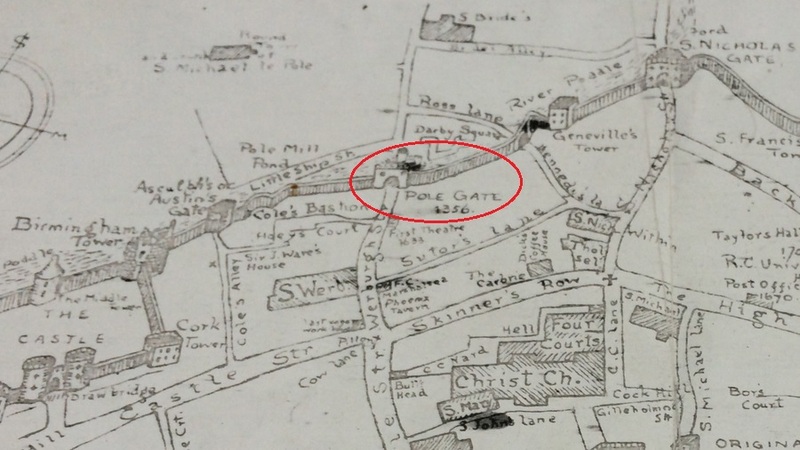 St Werburgh’s Gate (at that time) was also known as Le Pole Gate) and this is where Bollardt’s plot of waste land was located – somewhere near the intersection of modern day Little Ship Street and Werburgh Street. 1657 – Whereas Francis Gregorie, servant to Mr. Henry Ballardt, one of the Sheriffes of this cittie of Dublin, Baiiardt. did peticion unto this said assemblie, sheweinge that there is due unto his said master the somme of eightie pounds, sterling, for a banquett which hee furnished Banquet. this cittie with, on the freedome of the right honourable the lord Henry Cromwell unto this cittie, and for which Henry hitherto hee hath received noe payment, although hee hath had the cittie engaged for payment thereof; and Payment. therefore the peticioner humblie praied this assemblie to lay downe a course whereby the said monneyes might bee satisfied out of the treasurie of this cittie : it is therefore ordered and agreed uppon, by the forsaid authoritie. that Mr. Maior doe give a warrant unto the threasurer for payment of what is due as aforesaid. [DUBLIN ASSEMBLY ROLL, 1657.]. 1659 – St. Warbroughs Street. Sir Charles Coote, Henry Bollard, others. [Dublin Census 1659.]. it seems probable that Henry also had a daughter named Margaret. English— 274 ; Irish, 42. Tituladoes names : Knight and baronet : sir Charles Coote. — Knight : sir Oliver St. George. Doctor : — Alwoodhouse. — Esquires: William Bladen, Henry Bollard, Hugh Clotworthy, Carey Dillon, William Dixon, Hugh Price, Lewes Wallard. — Gentlemen : John Bran – ham, Roger Bould, John Bush, Edward Burrowes, Robert Cadwell, Samuel Cotton, Richard Crofton, Nathaniel Fookes, — Hasselham, Richard Hayden, William Hill. Thomas Hooke, Isaac John, Robert Johnson, Henry Keating, William Lane, Jonas Lee, Samuel Nicholas, John Norton, Thomas Parnall, Humphrey Poudyhard, Enoch Rider, Thomas Reynolds, William Sherding, William Stephenson, John Thornton, Robert Thornton, Sampson Toogood, Robert Treswell, Richard Webb, Ralph Whetlock, Richard Young. — Quartermaster: — Stanley. — Corporal : — Stiles — Matthew Langdale. Cooke Street : — Number of people: 181. English — 100 + Irish — 81. Tituladoes names : — Apothecary : John Bollard. — Distiller : Richard Ward. — Esquire : Richard Berford. — Gentlemen : Robert Ardogh, John Cardiff, James Eustace, William Harvey, John Hodges, William Hopkins, Patrick Mapes, William Plunket, Valentine Savage, James White. — Merchants : Edmond Clere *, Abraham Clemens, Paul Delasale, John Dutton, William Fulham, John Salmon, Samuel Saltonstall, Dominick White. Is this John Bollard (named above), Henry’s son or Henry’s father, or his brother ? This John Bollard(t) appears in the Dublin Assembly Rolls of 1657-8. Gold- smith. Hooke. Mary Drinkwater, Dorothy Maynard, spinsters, John Eon xia. Thomas, bitt-maker, Nathaniel Drinkwater. By special grace, and on fines : George Anderson, Samuel Braclway, John Rawlinson, merchants, John Glasier, smith, George Bennet, chandler, Abraham Kilby, mason. Admitted on having served apprenticeships : — Thomas Reynolds, John Bollardt, merchants ; John Partington, goldsmith, as apprentice to Daniel Bellingham, alderman ; Thomas Hooke, merchant, as apprentice to John Preston, alder- man ; Adryan Connor, barber-surgeon, Henry Aston, Thomas Handcocke, John Whittigarre, glovers. As sons of freemen : Christoper Dowde, shoemaker, Martin Connor. In right of wife : Thomas Fitzsimons, baker. * Is Edmond Cleere of Cooke Street related to James Cleere of Bridge Street who issued an ‘un-dated’ token about this time ? Entries: Index to Prerogative Wills of Ireland. A wonderful post containing some excellent and very informative research work making the world of the token issuer really come alive. What do you think the connection/inspiration is for the choice of the obverse design, i.e. the pot of lilies? Was an extract of these flowers used as a herbal remedy which was commonly sold by apothecaries of the period making the sign of the lily instantly associated with this trade? Does the same obverse design appear on any English or Welsh apothecaries tokens of the same period I wonder? King James I gave the apothecaries—originally members of the Guild of Grocers—their own guild in 1618, called the Company of Apothecaries. According to their charter, men from the apothecaries’ guild had the right to “go and enter into any Shop . . . House or . . . Cellar . . . of any Persons whatsoever, using or exercising the Art or Mystery of Apothecaries, or any part thereof, within the city of London . . . or within Seven Miles of the same city” to decide if the medicines made were acceptable. Foreigners could not join the Company of Apothecaries of London when it was chartered in 1618, part of the Apothecaries’ attempt to limit competition. The Company would not allow women to become trainees or members but they did admit widows of past members. Some apothecaries used the motto of the Society of Apothecaries. obiferque per orbem dicor (I am called help-giver throughout the world), or the Society’s crest.a rhinoceros (referring to the medicinal properties of rhinoceros horn). Occasionally a bunch of lilies was used in association with apothecaries. Did this indicate the floral source of therapeutic agents? Or was this a piece of Masonic symbolism or humour?